The above picture is from March. 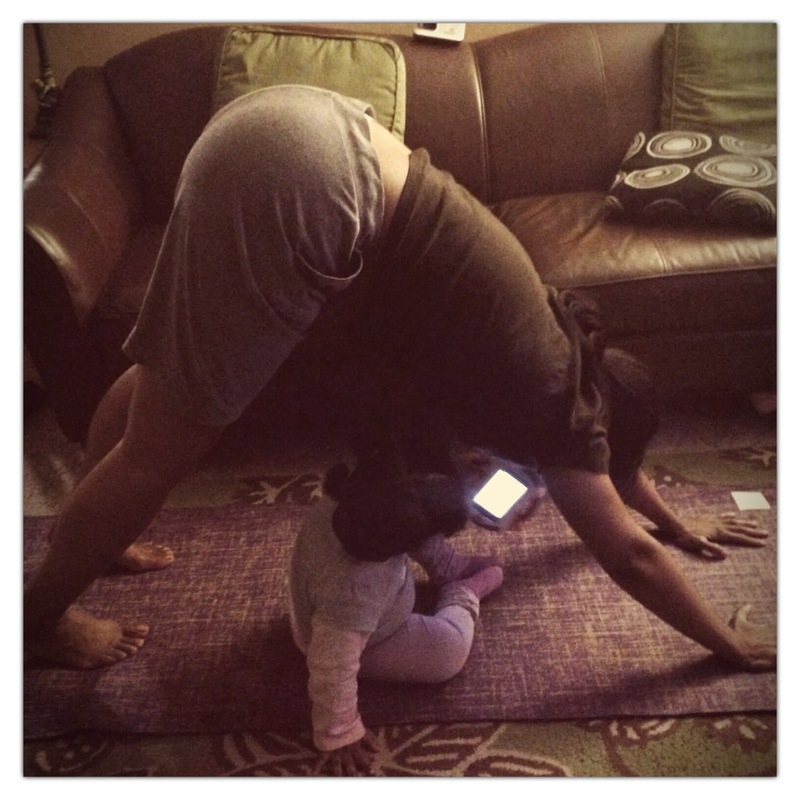 Mini Me took it while I was in my yoga rut. 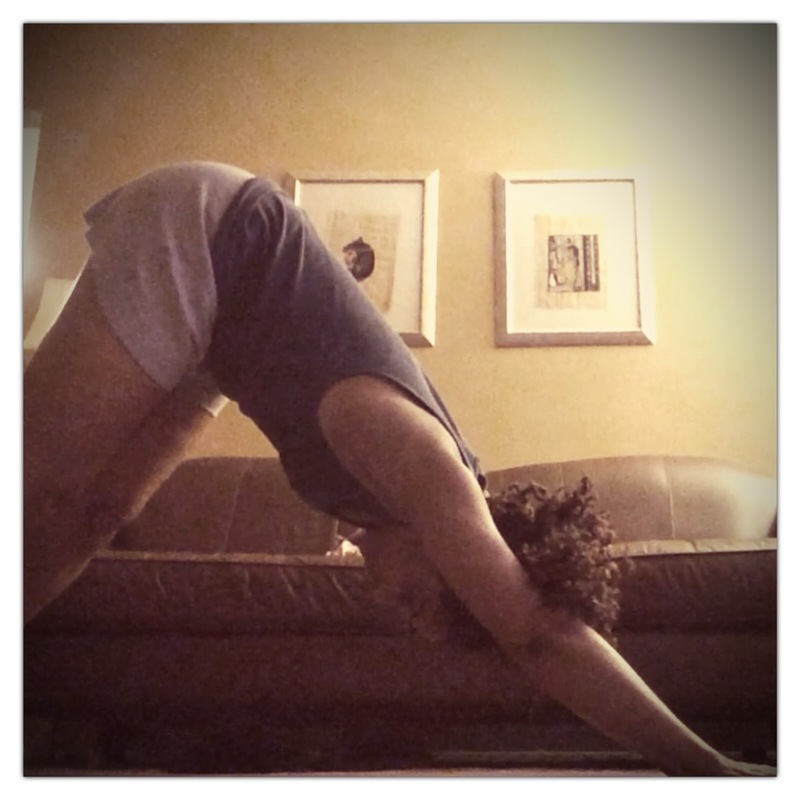 Whenever I crawled into downward dog, I felt stiff and awkward. I could say that Lil Ma camping underneath me didn’t help, but it’s not her fault. This was my standard pose. When Hubs suggested I take pictures of my poses and compare them to ones from a trusted yoga source, I gave him some serious side eye, but he wasn’t totally off base. What he didn’t know is that I had tried that, and I couldn’t always figure out how to adjust my poses. I needed help from a certified yoga instructor. The first was my former colleague-now-full-time-yogi, Becky. She saw my tragic downward dog pic on Facebook and offered advice on keeping my shoulders down and stretching my spine. “Breathe and think loooooong spine,” she wrote. My second and third instructors, Angie and Karen, are from a local yoga studio, Om Turtle Yoga. They too encouraged me to stop hunching my shoulders and to lift my rear-end, or “cupcake,” to lengthen the pose. In every class, Karen dutifully and gently adjusted my pose to get me to lengthen and lift. I took the advice home every week. I pressed and pulled and lifted to try for a better down dog. None of them felt right. Last week, I noticed that Karen took a deep breath as she adjusted my pose. It made me think about Becky’s advice again. Instead of worrying about what my down dog looked like, I started paying attention to how it felt. I appreciated the strength of my hands as they pressed into the mat. I took in full, deep breaths that were both relaxing and energizing. And when I remembered to lift my cupcake, my back got a great stretch. Down dog felt really good. Who knew? Turns out, the change in focus improved my pose too. Here’s my latest yoga selfie. More soon!